Last summer the Rankin Hinds Pearl River Flood Control and Drainage District published its Draft Environmental Impact Statement (DEIS) and Feasibility Study for Pearl River Flood Control featuring the "One Lake" alternative as its preferred plan for addressing Pearl River flooding in Jackson. Ranked by cost from greatest to least, the order of alternatives was: floodplain buyouts, levee improvements, lake dredging, and finally the "no action" alternative. Comments were due on September 6th and a final EIS is being prepared now for publication sometime in 2019. The pathway to approval of that final document leads through the Washington D.C. office of the Army Assistant Secretary for Civil Works.A recent press release highlighted the costs to replace nine road bridges over the Pearl River in and around Jackson if the One Lake dredging project proceeds. 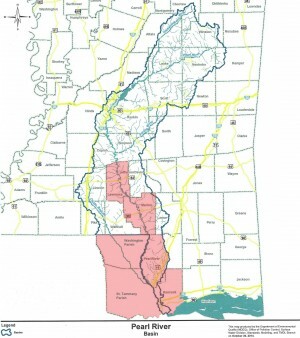 The Mississippi Department of Transportation (MDOT) pointed out in its official comment letter to the Drainage District that its Draft EIS/feasibility study did not adequately discuss how dredging a new lake on the Pearl River would impact the existing support piers holding up the I-20, I-55, Lakeland Drive, Hwy. 80 and Woodrow Wilson bridges in Jackson, Ms. The agency explained that the bridges would catastrophically fail if the footings of the bridges had sediments dredged away from them during lake construction. Under that scenario, at least $100 million dollars' worth of bridge work was left out of the Draft EIS by the Drainage District. Not including those costs helped make the lake dredging plan the least expensive flood control - alternative - aiding the case for "One Lake".The Draft EIS also gave an unrealistically low dollar figure for the cost of removing and remediating two old, unregulated, unlined Jackson City landfills and the Gulf States Creosote plant, a potential Superfund site, all located within the project area on the Pearl River. A soil assessment of the Gulf States Creosote plant indicated that there are 33 acres of contaminated soil at that location. These sites need to be excavated, remediated and stabilized if the lake plan moves forward. The draft EIS budget allocates only $8.07 million for "landfill removal" which includes " Mob, DeMob and Prep Work, Landfill Excavations, Clearing and Erosion Control, Turfing and Haul Roads." In striking comparison, a comparable mitigation project at Southeastern Wood Preserving in Canton is costing $14.5 million for 25 acres alone or $580,000 per acre. Again, the Drainage District's DEIS doesn't reflect the true cost of cleaning-up, moving or closing these hazardous waste sites.These are two examples of downplaying costs on its selected alternative (lake dredging) when it favors the Drainage District's cause. The Drainage District had five years to write its Draft EIS document and used a million dollars of Mississippi taxpayer money in the process. It had the opportunity to discuss these cost issues fully, but avoided doing so.Conversely, when it favors the Drainage District to increase the construction cost of alternatives it doesn't want to pursue, it follows different logic. The Mississippi Legislature's PEER Committee wrote a well-documented and thorough comparison of Pearl River flood control alternatives in 2010 and published it as PEER report 540, which is one of the clearest and best written documents about flood control on the Pearl River in Jackson. The PEER Committee report found in 2010 that the levee alternative was less costly than the lake dredging alternative. PEER did not include the cost of pumping stations in its levee alternative, following the lead of the Vicksburg Corps of Engineers from its 2007 study that found pumps not to be a necessary part of a levee plan.The Drainage District began its Draft EIS writing process only three years later in 2013, and by the time it published its document for public comment in 2018, it arrived at an opposite conclusion about the need to add pumps to a levee improvement plan. In direct conflict with both the Legislature and the Vicksburg Corps of Engineers, the Drainage District added pumps to their levee plan, increasing the cost of the levee alternative by $311 million. The addition of pumps made the cost of a levee plan more than double the cost of a lake plan: $729 million versus $345 million. The only other alternative seriously considered is a floodplain buyout and relocation of buildings in part of downtown Jackson along with two hospitals in Rankin County, all costing $2 billion.Mississippi taxpayers gave $1 million of public money to the Drainage District in 2013 through a Mississippi Development Authority Industrial Development Incentive Grant. So, all Mississippi taxpayers including ones down the Pearl River in Lawrence, Marion, Pearl River and Hancock Counties helped fund the Draft Environmental Impact Statement and corresponding feasibility study that make the case for building an urban lake on the Pearl River. It isn't an objective piece of work, but an argument. For a publicly funded document, there are some embarrassingly biased conclusions made using outdated environmental and species data. For example, the Drainage District's Draft EIS confidently explains how few Gulf sturgeon use the section of� river planned for dredging, and bends over backwards to describe a stressed, unhealthy population of Ringed Sawback turtles in the project area. It is clear that downplaying the quality of habitat helps keep mitigation costs low: replacing degraded habitat costs less than replacing high quality habitat. Both of these habitat discussions on threatened and protected species were roundly criticized by the U.S. Fish and Wildlife Service and other comment writers who found current data on these animals and used it to dispute the draft DEIS findings on habitat. �My favorite truth-stretching by the Drainage District is found on pages 188 and 189 of the draft DEIS document. The writers somehow found a way to state that water temperature increase is a bigger downriver and fish habitat threat under the levee alternative than under the lake dredging plan. They attempt to explain away temperature change as a lesser problem even after the narrow, tree-lined river is transformed into a wide, more exposed body of water with a much larger surface area. Those pages do worse than low-balling and manipulating costs; they defy the laws of physics. Water temperature is the single most important environmental factor in the lives of fish, mussels, aquatic insects and everything else in a river that uses gills for respiration. If you change a river to a wider, slower waterbody and remove all the shading trees, there is no question that the water will gain heat, or that dissolved oxygen levels will become a greater concern. Temperature increase is a stressor during the warm months in an impaired river like the Pearl that receives polluted runoff from urban creeks and ditches and already suffers from excessive nutrient levels. Slow down river flow with a new dam, widen and warm-up 10 miles of the Pearl, and river water quality will suffer.However rotten it may be to deliberately downplay habitat quality for federally protected species in a document required by Congress, the Drainage District is primarily concerned with the cost issue. This is because they will be asking the state to help pay for One Lake or whatever flood reduction plan is eventually approved. The District knows that cost is where the rubber really meets the road. Taxpayers and legislatures seek good value for money. The document that the Drainage District is attempting to slide through the public review process and push past the� Army Assistant Secretary for Civil Works� is a biased, self-serving report that should be rejected for what it is - a sales job written by a public agency to push an agenda. On the subject of bridges, dumps or pumps, the main message is that we are being sold on one favored plan, and Mississippi taxpayers are paying for the pitch.Andrew Whitehurst is GRN's water program director.